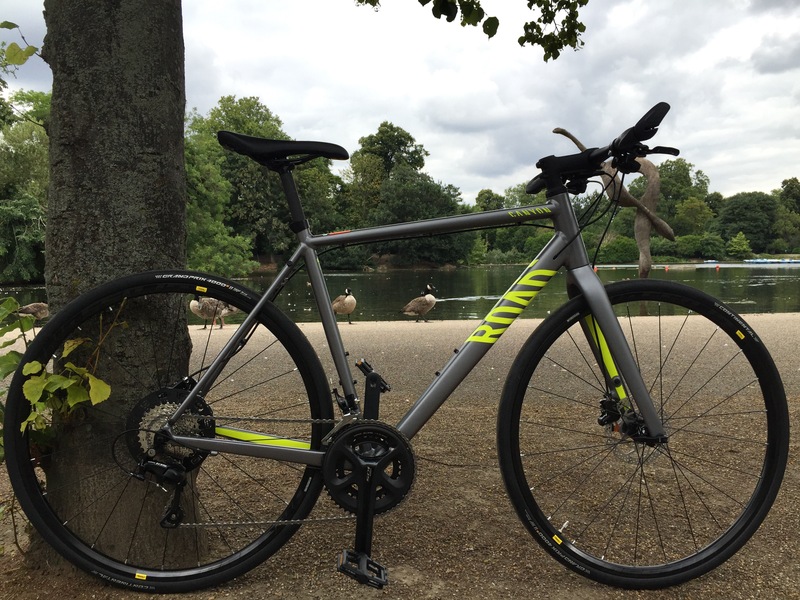 In my latest series of blogs on cycling to work in the city I take a look at the Canyon RoadLite. The guys over at Canyon got in touch and thought that this bike is the perfect bike for getting yourself in to the office in maximum comfort and style, and why not? Canyon make some fantastic bikes and are the supplier of pro team, Movistar. They have seen Nario Quintana ride to a Giro d’Italia Grand Tour victory and to second place, behind overall winner Chris Froome, in the Tour de France, taking the White Jersey in 2013. On top of all this, at the Rio Olympics 2016 they are supplying bikes for 20 different athletes from 10 different countries. To say these bikes have a thoroughbred then could be seen as an understatement, so what’s next for the German brand? Well, commuting it seems – and the Germans seem to take getting to work seriously. Canyon claim their aim while developing the RoadLite was to take the performance from the Grand Tour winning road bikes and combine that with comfort and this machine is ready to take you to a king of the commute. While it’s not a flat out road bike, it’s still a good weekend explorer, a road racer it is not, this is a fitness bike. So, what do you pull out the box when it’s delivered? Well, if you’ve ordered the same bike which Canyon sent me, the RoadLite AL 6.0, then you’ll notice the box wasn’t too heavy to carry from the delivery van to your home. For £719 you get a 9.20kg aluminium bike frame, two Mavic Crossone wheels, a Iridium saddle and a Canyon seat post with VCLS tech for extra comfort and stability. Canyon even through in a couple of in house made pedals too. This bike really does take aluminium to another level, I didn’t think that getting a bike this sturdy and this light was possible with just aluminium alone. However, if you spend an extra £250 Canyon will shed a further 700 grams by upgrading the gears and cranks from Shimano 105 to Shimano Ultegra, changing the wheels to DT Swiss R 24’s and giving you a carbon fibre seat post. For me the paying the extra £250 isn’t really worth it. If I were to buy this bike it would be a commuter, for that reason I don’t see the need to upgrade from the 105 to the Ultegra and get a couple of other jazzy upgrades. The middle of the road model, which this one is, is just right. But what is it like to ride? Well, I pumped the 28mm tyres up to 90psi and took it out for a 6 mile spin (similar to that of a commute) and you can find that on my Strava, if you want to look through it. I have to say, the bike is well balanced and extremely comfortable. Averaging around 12 mph the bike just cruises, there’s very little chance to get above 12 mph average cycling around central London to work, so this was a great little run out for this test. I didn’t even brake in to too much of a sweat, which was comforting to know if I were cycling to the office I wouldn’t be arriving in a shower of sweat. I found the bike stable and able to absorb the bumps and divots in the road, even though the saddle isn’t overly padded, you don’t feel the need for it to be as you don’t feel sharp juddering bumps up in to your nether regions. Let’s have a quick chat about the wheel base, it’s quite long. I got my measuring tape out and measured 110cm, compared to my road bike that’s 10cm more. which you would think would make the bike feel cumbersome and lethargic through the bends, not so, the bike still holds some cornering ability, it’s not as sharp as your road bike though. Yes Alex Dowsett, if you are reading, I agree – these can get very hot! You can see the stays for normal rim brakes if you replace them. jammed their brakes on, you have a hot disc coming towards your face… Not cool. The brakes on this bike, however – while they do still get hot – are fantastic. I know I keep going back to it but for a commute, you need sharp brakes, you never know when someone could step out on you, cut you up or just give you a reason to have to hit the brakes. I’ve never been so confident in hitting my brakes, you quickly drop your speed and not in a throw you over the handle bars kind of way. Worth a mention, there’s still the stays for rim brakes if you really feel the need to replace them. You can also see the internal cables for the gears here. You’ll notice the handle bars are a mini version of the bull bars you used to have on your mountain bike as a kid, so that when you were throwing your bike around it was softer on your supple hands. This is no different, while the brakes and gear are in the usual position you can position your hands slightly wider on the bars just for an added bit of comfort, a nice touch. I found the gears slightly awkward though, while they clicked in to place perfectly, I found them too central on the bars and with my hands sitting slightly wider it added a little movement of the wrist to click through the gears which just felt slightly off. So, would I part with my cash for this bike? Of course – I would happily ride it every day to and from the office. It would even be a nice little weekend warrior with the family, it’s so versatile. Stick a couple of paneers on there and you’ve even got yourself a shopping bike! What’s really notable is the little bits of detail on the bike. there are stickers near the cables to stop them from scratching the frame, the gear cables are even internal! On a bike for less than a grand! Unheard of. The colour scheme is superb and it’s very classy. A great bike for the price and getting you to the office! Here you can see the plastic labels to stop the frame getting scuffs from the cables. Hi, excellent post. I am actually really interested in buying this bike but I cannot find what is the tire allowance for this bike. My plan is to have 2 sets of tires, on with 28mm road and another set with a more rugged 33 or even 35 for some unpaved/gravel roads. I would very much appreciate if you could solve me this doubt as I have called canyon directly but couldn’t give an answer. Hello, really nice review ! In the meantime, on a french forum, someone told me that his Roadlite AL 7.0 from 2016 (which is exaclty the same bike, just different tires) has 10mm of clearance on either side of the 28mm GP4000s tires. Son I guess one can fit 35-40mm tires. It is true that the Inflite is designed in order to go off-road, but the frame is more compact then more responsive. On the other hand the geometry of the Roadlite is more comfy, relaxed. In my opinion both frames should resist to light gravel touring. _costs 400€ less with the same Ultegra 6800 groupset !!! _eylets for mudgards and rack, in case you need it. I have the canyon roadlite 2016, and I fitted 700c-42mm continental speed ride and also mounted sks velo 42 mudguards with stays. I think it can go up to 50mm without mudguards. The 42mm tires makes it such a versatile bike that can go almost anywhere. It’s such a capable bike for the price.